During the month of March, Three Point Employees were raising funds for Charity. 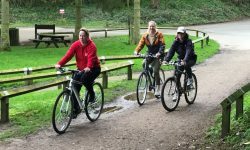 Female staff took park in a sponsored bike ride, whilst male staff spent the month growing beards. Thanks to contributions from Three Point Suppliers, as well as employee’s friends and family, over £1100 was raised for three local organisations. LOROS Hospice is a Leicester charity providing compassionate care and support for over 2,500 terminally ill adults across Leicester, Leicestershire and Rutland every year. LIFE Supporting pregnant women and young mothers to work towards a bright future. STREETVIBE working with young people between 11-19, offering a safe, secure place to have fun, using mobile Youth Clubs.